In 1127, the Song Dynasty (960-1279) lost control of its northern territories and they fell under the jurisdiction of a regime known as the Jin Dynasty (1115–1234), which was led by the nomadic Jurchen people. For over 100 years, China was split virtually down the middle, with the Jin Dynasty ruling the north and the Southern Song Dynasty (1127–1279) reigning over the south. Talk about a north-south divide! Yet that was all to change when a formidable enemy, stronger than any the Chinese had ever faced, loomed on the northern borders. With a horde of Mongolian soldiers at his back, the infamous Genghis Khan stormed the Jin Empire in 1211. By 1234, under the leadership of Ögedei Khan, both the Jin Dynasty and the Tangut-led Western Xia Dynasty (1038–1227) had been annexed by the Mongol Empire (1206–1368). When Kublai Khan took over in 126 4, he set his sights firmly on the south. In 1271, after a series of successful military campaigns in Sichuan province and the Yangtze River Basin, he declared himself Emperor of the Yuan Dynasty. Although the Song Dynasty managed the longest resistance against Mongolian forces in history, it was finally conquered in 1279. In an ironic twist, China had finally been reunited not by the Song, but by non-Chinese invaders! This was the first time in history that China was ruled by a foreign people. For more than 300 years, China’s history had been characterised by conflict. From the chaotic Five Dynasties and Ten Kingdoms Period (907-960) to the confrontation between the Southern Song and the Jin Dynasty, the empire had been constantly chopped and changed between numerous warring regimes. Arguably the most significant achievement of the Yuan Dynasty was the successful and relatively permanent unification of China’s entire territory. However, as with many foreign dynasties, the Yuan emperors struggled to reconcile their own culture with that of the people they ruled. While Kublai Khan proved to be a capable ruler who accepted the counsel of both Mongolian and Han Chinese advisors, his successors would prove to be far less astute and strong-willed. Yet it wasn’t just the incompetence of the emperors or corruption within the palace that caused the downfall of the Yuan Empire. In many ways, the Yuan Dynasty was marked by distinct signs of colonialism and this resulted in internal strife. A strict Four Class Social System, which placed the citizens of the Southern Song Dynasty at the bottom of society, dictated that Mongolian people receive certain sweeping privileges that were denied the rest of the country’s population. In short, many native ethnic groups in China felt as though they were being treated as second class citizens in their own country. Natural disasters, famine, and civil unrest eventually led to a series of revolts throughout China, the most prominent of which was the Red Turban Rebellion in 1351. From amidst this chaos, a particularly talented rebel leader named Zhu Yuanzhang came to the fore. Zhu was an orphan who had spent much of his early years as a beggar before joining a Buddhist monastery. From rags to riches, he would soon find himself transformed from humble monk to Emperor of China! 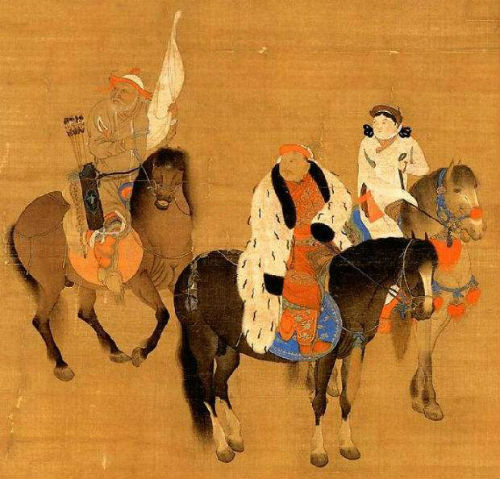 Although Zhu was not the official leader of the Red Turban Rebellion, it was his successful military campaigns that eventually drove the Mongolians out of central and southern China. In 1368, he announced his intention to liberate the whole of China from the Mongolians’ grasp and established the Ming Dynasty (1368-1644). By the end of his 30-year reign in 1398, the Ming Empire had taken control of China and effectively driven out the Mongolians. Meanwhile, the descendants of Kublai Khan retreated to Mongolia and established the Northern Yuan Dynasty (1368-1388), which was eventually conquered by the Ming in 1388. Although it may not have achieved the prestige of the preceding Tang (618-907) and Song dynasties, the Yuan Dynasty made a notable impact on Chinese culture. In particular, the resentment that the native Han Chinese felt towards their Mongolian overlords prompted them to isolate themselves even further, maintaining their cultural traditions with a panicked fervor and seemingly rejecting many outside influences. However, the sheer vastness of the Mongol Empire meant that, for the first time, China boasted strong connections with countries as far-reaching as Persia and Italy. It was during the Yuan Dynasty that the celebrated Venetian explorer, Marco Polo, made his fabled journey to China. His account of his travels introduced European countries to a place that had hitherto been the stuff of myths! Medicine, science, astronomy, and mathematics made drastic leaps during this time, as knowledge from Central Asia and Europe gradually trickled into China. The increased use of paper money stimulated the development of commerce, while even art made progress in the form of landscape paintings by the Four Great Masters of the Yuan Dynasty: Huang Gongwang, Wu Zhen, Ni Zan, and Wang Meng. Rather than straining under the yoke of oppression, the open-mindedness of the Mongolians towards religious and artistic expression meant that, in many ways, citizens in China were free to culturally blossom.